Israel will be among the first countries to ban horse-drawn carts from city streets and highways once the Knesset Finance Committee approves the Ministry of Transportation’s new regulations that were suggested to it by Hakol Chai, the Israeli sister charity of the U.S.-based Concern for Helping Animals in Israel (CHAI). CHAI is part of the International Coalition to Ban Horse-Drawn Carriages. Organizations and individuals who are members of the coalition have been working in many countries to end this outmoded and cruel practice, but Israel will be one of the first to impose a nationwide ban. "We are thrilled to see the light at the end of the tunnel in our struggle to end this terrible, outmoded phenomenon that has no place in the modern state of Israel," said Hakol Chai representative, Michal Volansky." Horses and donkeys are used in Israel to haul furniture, scrap metal, rocks from construction sites, heavy produce like watermelons to market, and old clothing. They are often starved, beaten, denied veterinary and farrier care, forced to stand in the hot sun all day without water, and to wear ill-fitting harnesses that gouge into their flesh and create untreated wounds. At the end of the summer or when they are too ill or weak to work, they are abandoned. Some collapse in the street, still in their harnesses. International animal protection organizations sent congratulatory letters to Transportation Minister Israel Katz in honor of Horses Without Carriages International Day, December 1, praising his decision to adopt Hakol Chai’s suggested regulations and expressing gratitude for his forward step that demonstrates positive and humane leadership. People for the Ethical Treatment of Animals (PETA) President, Ingrid Newkirk, emphasized that "inhumane and dangerous conditions cannot be corrected with regulation; this ban is the only solution." Elizabeth Forel, President of Horses Without Carriages International, noted the success of coalition members in focusing media attention on this worldwide problem and in gaining the support of numerous celebrities. Besides Hakol Chai in Israel, the global coalition of groups and individuals includes active members in many U.S. and Canadian cities and in international cities including Dublin, Florence, Rome and Vienna. CHAI/Hakol Chai’s campaign to end this cruel phenomenon, launched over ten years ago, repeatedly exposed severe abuse to these animals—some of which the NGO rescued and rehabilitated—closed down horses abusers, appealed to the Ministry of Transportation and Mayors throughout the country, presented a proposal to the Tel Aviv City Council that resulted in its discussing the issue for the first time, held demonstrations, launched a major rally at which celebrity singers and musicians performed, and more. Over the past month, Hakol Chai representatives worked with legal and other professional advisors from the Ministry and the Police to draft suggested wording for the new legislation, which will go to the Finance Committee in the Knesset for final approval. "We will now turn our efforts to ensuring that the law is enforced everywhere in the country," said Volansky. 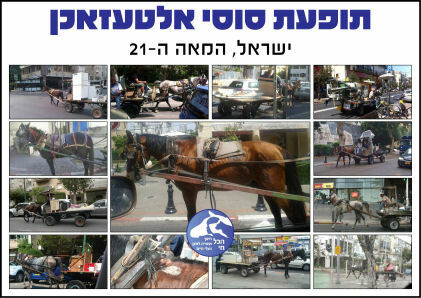 Current actions include a "witness" campaign, urging people throughout the country to use their cell phones to send Hakol Chai photos of cart horses and their drivers so it can assess the extent and location of the problem and so when the new regulation is enacted, it can quickly notify the police to issue fines and remove the animals from the streets.